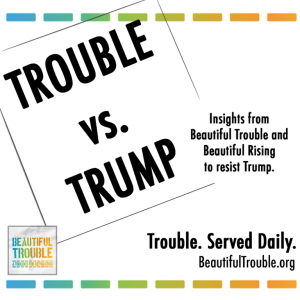 Drawing from the Beautiful Trouble and Beautiful Rising toolboxes, here are six key concepts that may prove useful to movements preparing to resist Donald Trump’s presidency. 1. Clinton’s neoliberal ‘realism’ lost the election. Now what? In sum: Neoliberalism, today’s dominant ideology, reduces the state to a handmaiden of transnational capital. In pursuing the relentless privatization of the commons, its policies inevitably spark popular discontent. Donald Trump didn’t so much win the election as Hillary Clinton lost it. Clinton’s failure to turn out the Democrats’ traditional base on election day should be understood as a catastrophic failure of the Democratic Party establishment to fire up their base by responding to the growing public opposition to neoliberalism. This, in effect, was the key difference between Hillary Clinton and Bernie Sanders in the Democratic primaries: Sanders named the enemy — increasing concentration of wealth and power in the hands of a few under deregulated capitalism — and vowed to confront that power. Hillary Clinton preached a “realism” that simply accepted the ground rules of neoliberalism unchallenged. Compared to Trump’s repeated focus on how the country’s leaders had failed the working class, Clinton copped to glib assurances that “America is already great” that had zero resonance in communities where most people are struggling to make ends meet. Understanding what neoliberalism is and building organizations capable of offering both resistance to it and viable political alternatives must be front and center for U.S. progressives who are committed to real systemic change in the months and years ahead. 2. To resist Trump, we need both ‘expressive’ and ‘instrumental’ actions. In sum: Political action tends to be driven by one of two different motivations: expressing an identity and winning concrete changes. It’s important to know the difference, and to strike a balance between the two. Most experienced organizers think on another, more “instrumental,” level. Regardless of the self-expressive value for those involved, organizers ask, “What is this action actually achieving?” While the best actions can be both expressive and instrumental, if we confuse the two purposes, say, expecting a primarily expressive, feel-good action to have specific results like forcing the hand of a power-holder, we will likely be disappointed. In the era of Trump, America risks sliding from a liberal democracy into a more authoritarian regime. Our understanding of protest and power must shift along with it. In the Obama era, symbolic protest could (sometimes) get attention and exert pressure on sympathetic power-holders. Not so under Trump, where our strategic stance must now take into account the higher stakes and evolve tactically into “regime resistance.” Yes, we need healthy political self-expression, but we also need to be thinking strategically and “instrumentally.” An example of a more instrumental set of actions are the rolling “phone-jams” being done to exert economic pressure on Trump businesses until neo-Nazi Steve Bannon is booted from the Trump White House. Another example is the growing resistance to Medicare privatization, a campaign that is winnable, and cuts across regional, racial and class divides. It could also have lots of additional benefits: Potentially alienating Trump from his base, slowing his momentum, and exacerbating splits between Trump and the GOP. Trump did not reach the White House by offering a coherent economic policy or political platform. Rather, he made a cultural appeal to voters discontented with the direction in which they saw the country going. We need to understand this cultural wave that helped lift Trump to the presidency if we are going to counter his administration’s policies and divert some of this discontent toward more progressive ends. A significant part of Trump’s campaign was based in white identity politics. He stoked racial fears while offering a nostalgic vision of a time when the privileges of white Christian men went unchallenged. This aspect of Trump culture is toxic, and must be countered at every turn. Other aspects of Trump’s appeal, however, resonate with the concerns of many on the left and can be built upon to support radical politics. Trump effectively played on people’s utter disgust with a “rigged” two-party system that is elitist, out of touch, and in thrall to undemocratic interests. He spoke to a feeling that the economy has left many, many people out even as it has “recovered.” These appeals may seem a bit absurd, given Trump’s own elite background and support for Wall Street over Main Street, but they offer potential leverage points for holding Trump accountable and crafting effective cultural strategies. Every time he nominates an establishment politician, or gives a tax break to the wealthy, there is a crack in his narrative that can be exploited. A word of caution: We shouldn’t overestimate the strength of Trump’s narrative — he did, after all, lose the popular vote amid very low turnout. We also shouldn’t simplify the story, for example painting Trump voters with a broad brush as poor and working class whites. Much of Trump’s support came from traditional Republican strongholds (read: wealthy white people). Still, Trump’s discourse during the election has shaped the cultural terrain that he is about to step into, and that terrain, while largely hostile, has some pitfalls we should be taking advantage of. 4. Now more than ever, we’ve got to take care of one another. As the large numbers of women and minorities signing up for self-defense classes since the election testifies, many people are taking the threat of Trump very seriously. The threat of violence against activists, both directly from the state and indirectly from individuals and groups emboldened by Trump’s rhetoric, has escalated greatly in the last year and may continue to rise. To counter this threat, we must reach out to and support one another: report threats we’ve received, reach out to others who have been targeted by threats, disrupt and defuse bullying or harassment when we see it, form networks of support, share skills and resources, and call on organizations that can assist. The Southern Poverty Law Center, National Lawyers Guild, ACLU, the Anti-Fascist Network, and the Sanctuary City and Sanctuary Campus campaigns are just a few. 5. We have a lot more leverage than we might realize. If we are going to mobilize people to effectively resist the Trump agenda, we must pick our battles wisely, and recognize where we can intervene to have the greatest leverage. 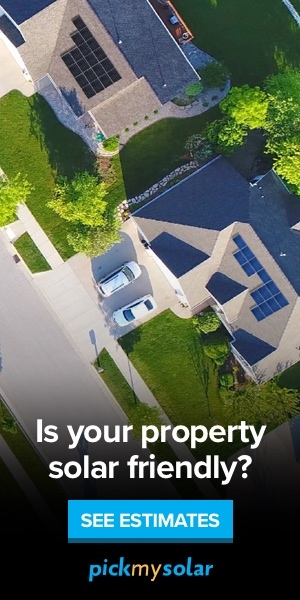 It’s worth considering five different types of points: production, consumption, destruction, decision and assumption. For example, ongoing boycotts and targeted phone-jams of Trump’s business empire are applying economic pressure at the point of consumption. Trump’s threat to deport millions of undocumented Americans is being forcefully resisted by rebel cities and a new Sanctuary Movement that will challenge migrants’ criminalization at the point of assumption, and potentially, through mass direct action at airports, train and bus stations, at the point of destruction. Strikes and other point-of-production actions have historically been used to resist terrible presidencies. Yes, the presidency is a powerful office, but there are many, many other points of decision at which we can intervene and win victories: Remember how during the dark days of the Reagan presidency, ACT-UP brought the fight for justice for people with AIDS directly to drug companies and the FDA. In sum: Nonviolent action works best when you stay nonviolent. 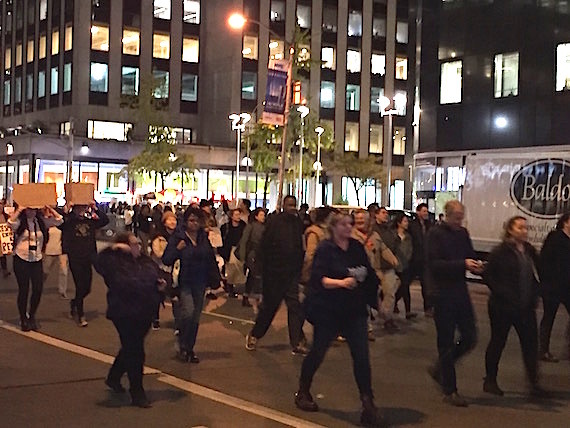 In sum: Use strategic nonviolence to create a framework for broad-based direct action conducive to building large, inclusive, diverse and effective movements. Decades of historical research has again and again shown that nonviolent movements are twice as effective as violent ones. The ugly turn towards a Trump presidency is only likely to reinforce that truth. Maintaining nonviolent discipline in our actions is a critical key to unlocking successful movements and winning victories. Nonviolent action helps build people power by lowering the bar to participation. (Movements that are able to mobilize just 3.5 percent of their populations are almost always successful.) In addition, nonviolent action can reduce the likelihood of retaliation by authorities and, if they do retaliate, reduce the legitimacy of that retaliation. A public stance committing to nonviolence can help identify violent agent provocateurs, reducing infiltration and disruption of the movement. Moreover, a commitment to nonviolent action encourages creativity (unlike a reliance on violence which typically gets us into a same-old-same-old rut) — and the more innovative our tactics, the more likely we are to win.